I realize I had three blog posts last week, but because I haven't actually taken proper blog photos in a couple of weeks, I feel like I haven't blogged in awhile! It always feels good to get back into the saddle. Though admittedly, it's been raining for a good two weeks now, making blog photos stupid, and us having to be creative on where we can catch some outfit photos without getting drenched. The struggle is real guys. This is my typical weekend uniform and it makes me happy. I really don't know why I didn't turn to baseball caps sooner in life! Our Saturday usually consists of us sleeping in without an alarm and just waking up when our bodies are ready! We lay around until we get hungry, then we find someplace to have our breakfast. I legit rolled out of bed, threw on this outfit, and off we went. Ok, disclaimer, I did put on some moisturizer, foundation, and lip color, but lash extensions allow me to skip all the eye stuff! This hat popped up in my Facebook feed, and I gotta say, those Facebook analytics work really well because it was right up my alley. 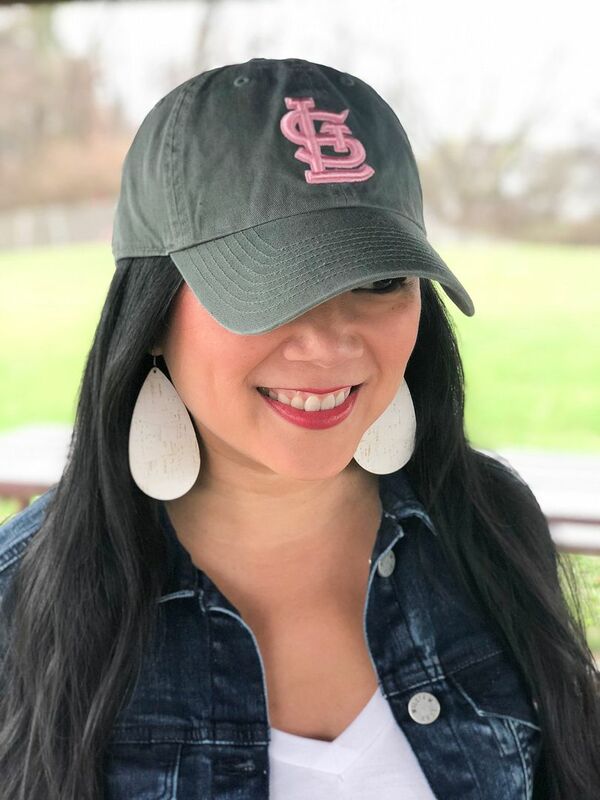 I love supporting my Redbirds, but bright red hats don't always work well with every day outfits. This hat allows me to show my team spirit in non-gameday clothes! And these earrings!!! So many heart eyes. They may be my favorite Nickel and Suede pair to date. I don't know why I waited so long to get white earrings! The cork add such a great texture! I've worked with The Mint Julep Boutique a few times in the past, and another collaboration was long overdue. It was fun to poke around their site and see all their cute stuff. 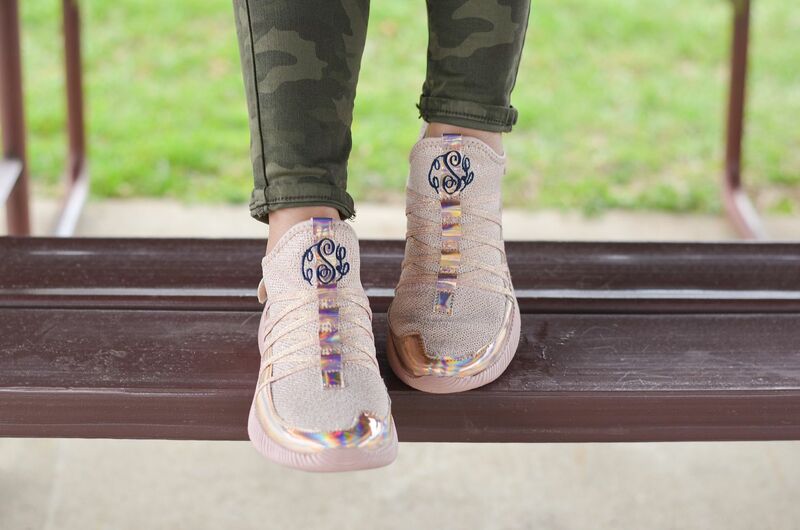 I kept on thinking about these monogram sneakers because I've been wanting some blush/mauve colored sneakers for awhile now, and well, the monogram just gets me. I fell in love instantly! And they are so well priced! $32 + $4 for the monogram, but when you sign up for their emails, you get $10 off your order, so that really makes these babies $26! Whoa! And considering that price, they're quite comfortable and nicely made. I was impressed! They have a really great selection of monogrammable sneakers - see them all here! I have one other favorite from The Mint Julep Boutique that I will share with you soon, but in the meantime, you can shop around their site here. 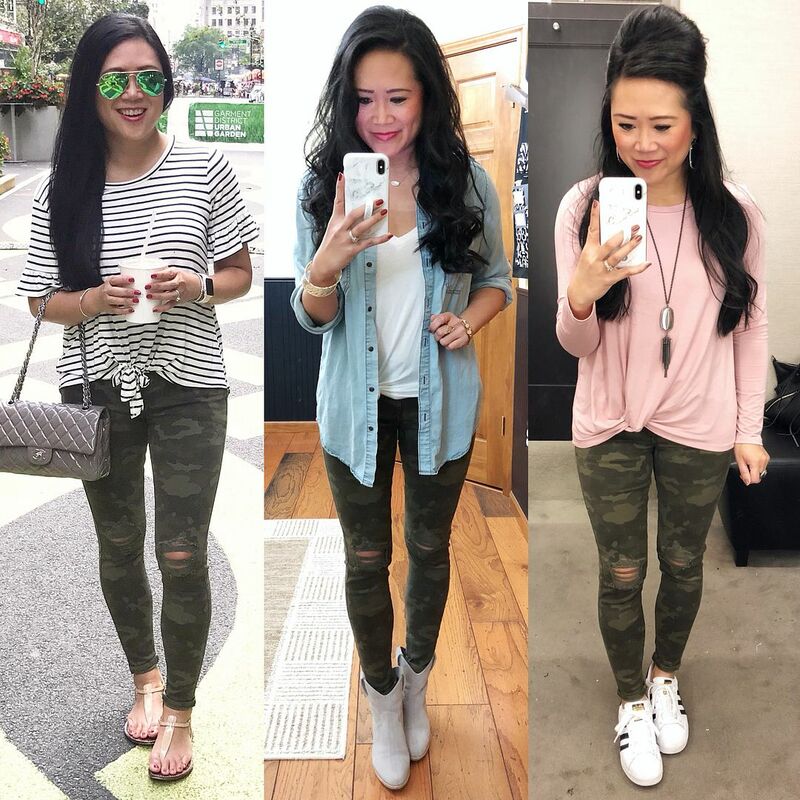 Before I go, I thought I would share three other ways I've styled these camo pants. I remember a time when I struggled with what to wear with camo pants! But I realized, a good camo print is no different than styling solid color olive; the camo just adds some subtle interest with the tone on tone pattern. That's all I have for you today! Hope you had a great Easter weekend a great week to come! Super cute weekend uniform! I am loving the camo pants and your sneakers are adorable! How fun! Happy to see you back to the swing of thing, you are rocking these camo jeans. Love this cool casual look Carylee! I need these jeans. Thanks for the link up! 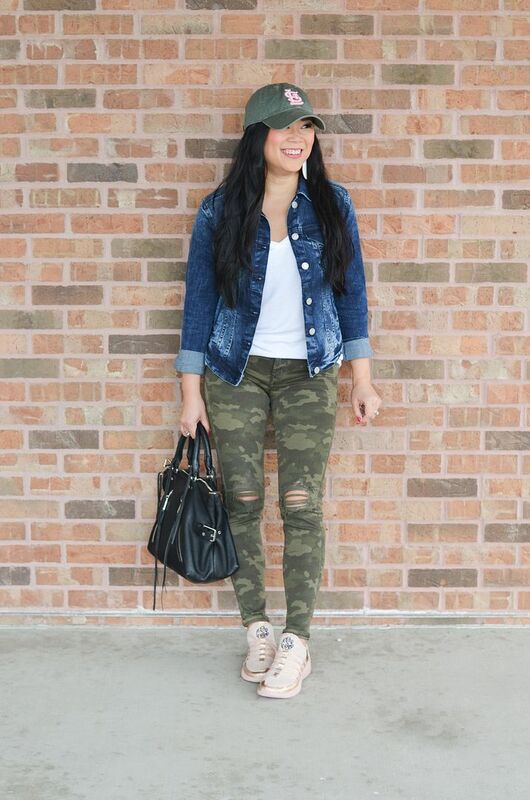 Love these camo pants....super cute. And who doesn't need a pair of monogramed kicks?! Happy Monday! I'm impressed you were able to make photos happen in the rain! I haven't mastered that skill yet, but I do agree with you about camo being easier to pair than expected. With the right camo blend it's really quite neutral. I totally feel you about the photography, but you look great anyway! Your jeans are so cute and I love those sneakers! 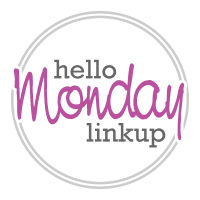 Thanks for the linkup! 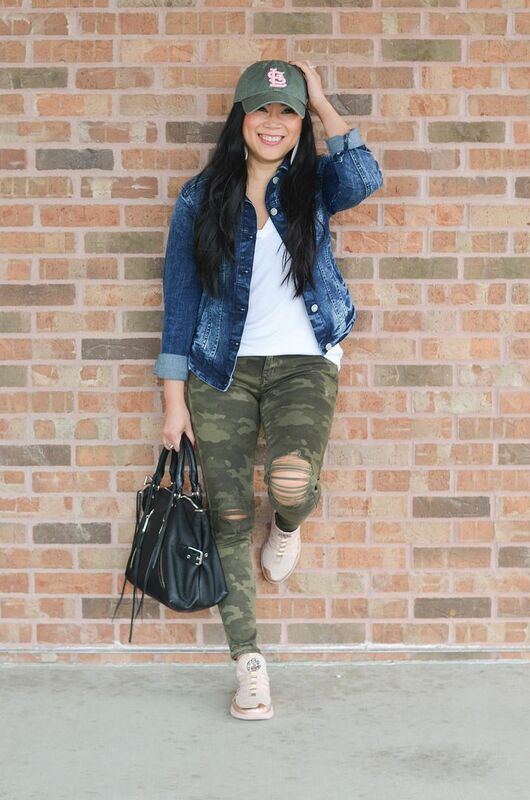 Such cute shoes, I love the camo pants too. i just love blush and olive together! Great casual weekend style! I wish it was warm enough here to wear my denim jacket!